BENGALURU (March 17): Southeast Asian shares gained on Friday, with Indonesia hitting a record high, as the dollar rally eased after the U.S. Federal Reserve signalled a slower pace of monetary tightening. Broader Asian markets were higher as the U.S. dollar fell to a near five-week low, after the Fed on Wednesday stuck to its outlook for two additional rate increases this year. 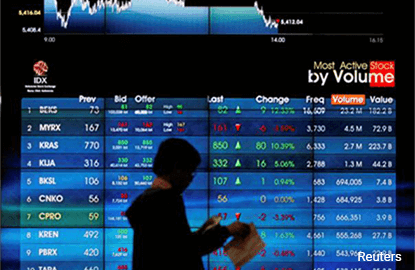 MSCI's broadest index of Asia-Pacific shares outside Japan rose 0.3%. "Regional markets gained as the dollar rally waned. They had been pricing in the rate hike since last week. So, the dollar had been strengthening and that was really putting pressure on blue chips," said Victor Felix, an equity analyst with AB Capital Securities. Dollar bulls are closing their positions towards the weekend and that has tapered out the rally, he added. The dollar index, which gauges the greenback against a basket of six major rivals, edged down 0.1% to 100.26, after coming within a tick of the overnight low of 100.21, its lowest level since Feb 9. Indonesian stocks rose as much as 0.7% to a record high in their fifth straight session of gains, as financials rallied after the country's central bank kept interest rates unchanged and said it expects "relatively strong" growth in the first quarter of 2017. "Interestingly, the central bank sounded more upbeat, even if it continued to warn on risks stemming from the external front," DBS Research Group said in a note. "Bank Indonesia indicated investment growth is picking up, particularly in non construction-related investments. Stronger export growth is also seen to help boost overall 1Q17 GDP growth," it added. Bank Rakyat gained 3.2%, while mining contractor United Tractors rose 2%. An index of the 45 most liquid stocks was up 0.5%. Malaysian shares gained the most in Southeast Asia, rising as much as 0.9% to their highest in more than one-and-a-half years. CIMB Group was the top gainer on the index, adding 1.6%, while telco Axiata Group gained nearly 2%. Singapore stocks were up as much as 0.35% to their highest since August 2015, as Sembcorp Industries added 1.2%, while DBS Group Holdings gained 0.4%. Singapore's February non-oil domestic exports grew at their fastest pace in five years, data from trade agency showed on Friday.